Dorres village is located in the Regional Natural Park of the Catalan Pyrenees. The department has 11 nature reserves, it is oriented towards the protection of nature. The highest part of the department of Pyrénées-Orientales is situated in Cerdanya, vast elevated plateau that ranges at an altitude from 1200 to 2960 meters. 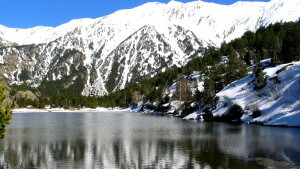 The Cerdanya offers two nature reserves included in the Regional Natural Park of the Catalan Pyrenees: a Eyne valley and the site of Bouillouses lake. These reserves help to preserve the natural fauna and flora by regulating the tourism and economic activity. They are designed to protect, conserve, manage, inform and educate in order to transmit to the next generations its rich natural heritage.